Would you like some edible perfume? Let's all take a moment to think about what could have been and what was. In April 2004, Jessica Simpson launched Jessica Simpson Dessert by Jessica Simpson, one of the greatest gifts the world was ever given. The line consisted of lip gloss, body shimmer, perfume, and other stuff that would not only make you irresistible, but tasty. At events Jessica would demonstrate just how delicious her products were by having then-husband Nick Lachey eat them off her. 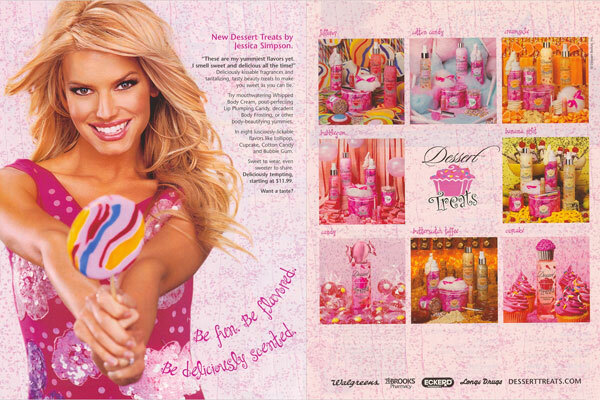 In February 2005, Dessert Treats, the same products for a younger audience, was launched. It was an amazing time to be alive. Unfortunately, after multiple lawsuits, both lines were eventually discontinued. But, you can still find the products on sites like Amazon and eBay. The beauty industry may never recover from allowing such a thing to happen. Jessica Simpson Dessert by Jessica Simpson and Dessert Treats were gifts from above, gifts that never stopped giving. And, to this day, every man, woman, and child lucky enough to have tasted them still yearns for their delicious flavor.